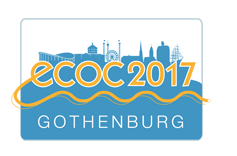 We would like to thank you for accepting to participate to ECOC 2017 in Gothenburg. Below you will find some information that will help prepare your contribution. All authors should have at least one registration attached to their paper on or before Thursday, 13 July in order to be included in the conference proceedings. Presenters must report to the Speaker Preview Room and hand in the presentation at least 1 hour prior to your talk! The presentation will then be sent to the room and each room has a technician that will assist and start the presentation for you. No use of personal laptops will be allowed. Please bring your presentations on a USB memory stick in MS-Power Point or Adobe PDF format to the speaker preview room at least 1 hour prior to your presentation! Note that there will be no presentation uploads in the conference rooms. All presentations must be uploaded in the Speaker Preview Room prior to your presentation. Technical personnel will test-check your oral presentation for compatibility. Please give the technical personnel any special instructions you may have when you are in the Speaker Preview Room, not during your lecture. The standard format of the projectors in the conference rooms is 16:9 (wide screen). The default slide size in PowerPoint 2013 is widescreen (16:9), for earlier versions of PowerPoint it might be necessary to manually change this. Change the slide size from standard (4:3) to widescreen (16:9). after your session, posters not withdrawn after the day will not be saved. Each poster board is marked with a poster ID-number. Please find your poster ID-number in the final Programme (available later on the printed or PDF version). Authors are required to stand by their posters during their whole scheduled poster session time on Wednesday and Thursday. The maximum size of your poster should be 90cm (width) x 120cm (height), portrait style. We wish you good luck while preparing your paper and thank you for your cooperation! Sweden MEETX AB is the conference bureau handling the conference secretariat for the 43rd European Conference on Optical Communication.